Ah! Ho! Ha-ha! Guard! Turn! Parry! Dodge! Spin! Ha! Thrust! Ok, so Robin Hood and the Merry Men doesn't take place in the Warner Brothers universe, but whenever I think of ol' Robin, I think of Daffy. 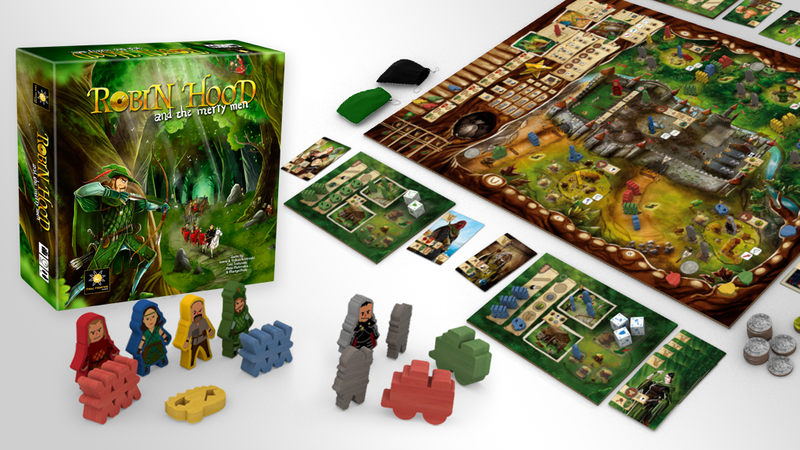 And we've got Robin Hood up on Kickstarter with Final Frontier Games' Robin Hood and the Merry Men board game. It blends together set collection, worker placement, some dice rolling, and more to give you a semi-cooperative game. “Robin Hood and the Merry Men” is a thematic euro style game that perfectly blends worker placement, hand management, set collection and dice rolling into a one big exciting crossover. It’s a fun game with multiple paths to victory, where you will live and breathe a true Robin Hood style adventure. The players take on the role of a famous outlaw such as Robin Hood, Little John, Will Scarlet and Jane Fortune, and their mission is to protect the town of Nottingham from the tyranny of infamous ruler Prince John and the notorious Sheriff of Nottingham throughout 5 rounds of onslaught. If they succeed, a winner is declared-the player with the most victory points becomes Nottingham’s greatest champion. The art for the game is done by The Mico, the same artist behind the beautiful art in Final Frontier Games’ previous projects ‘Rise to Nobility” and “Cavern Tavern”, so “Robin Hood and the Merry Men” is expected to be a direct hit. “Robin Hood and the Merry Men” is a game for 2-4 players, ages 13 and up, and takes approximately 25 minutes per player to play it. The Kickstarter Campaign will feature a Standard version of the game and a Deluxe version. Both pledge levels will come with options for shipping worldwide, and they will be available for retailers as well. The campaign is closing in on 6x funded with still 27 days to go.